August 26, 2015 /59 Comments/in Featured Articles, White Racial Consciousness and Advocacy /by Andrew Joyce, Ph.D. In the sphere of Continental right-wing populism, the trend has been no less pronounced. Observing the creeping Islamic invasion of Europe, several key leaders on the European Right have carelessly abandoned centuries of wisdom gained from their forefather’s interactions with Jewry, and have adopted a worldview in which Islam is the primary enemy of the European people. Ignoring the well-documented role that Jews have played in opening our borders and silencing honest racial discourse, these leaders have instead moronically reached out to Israel, which they see as being at the front line of a “Judaeo-Christian” holy war with Islam. Examples are plentiful. The Front National (FN) in France has expressly distanced itself from “anti-Semitism” and its leaders have even portrayed themselves as “the only true protectors of Jews in Europe.” Since assuming party leadership in 2011, Marine Le Pen has worked to “modernize” her father’s party — essentially the process of purging its anti-Jewish, anti-Zionist elements. Le Pen demoted party figures like Christian Bouchet for his support of Iranian President Mahmoud Ahmadinejad, and expelled Alexandre Gabriac for the drunken indiscretion of giving a taboo salute during a party. 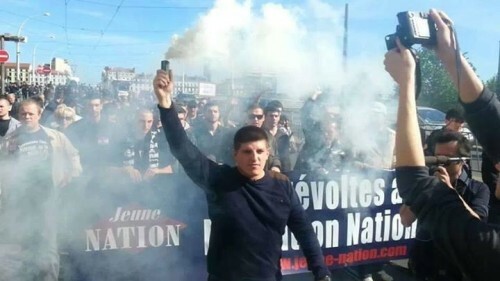 Alexandre Gabriac: Unlikely to be seen waving Israeli flags any time soon. As early as 2009 Le Pen began distancing herself from Alain Soral, relegating the vocal anti-Zionist to an “honorary” position in the 2009 European election campaign before the latter decided to cut his losses and leave the party. An “honorary” position was also, of course, bestowed upon Le Pen’s father, effectively rendering him a figurehead devoid of actual power or influence. Quite apart from these purges, Marine Le Pen has made a series of overtures to organized Jewry. In 2011, during a trip to the United States, Le Pen managed to get a well-publicized meeting with Israel’s ambassador to the United Nations, Ron Prosor, who attended a gathering she hosted at the United Nations. Although Israel’s foreign ministry later rushed to explain that the meeting was based on a “misunderstanding,” Le Pen made much of the evening’s press releases, which depicted a smiling Prosnor standing next to her. But to what gain or reward? If, as some commentators have suggested, Le Pen is merely playing an excellent game of political strategy, has it paid off? Does it even show any signs of succeeding? Is pandering to the Jewish vote, upholding the taboo on discussing Jewish influence, and apologizing for “anti-Semitism” the way forward for populist politics? Is this how the West is to be reclaimed? As with the case of the BNP there is much evidence to indicate the negative on every count. As TOO’s Peter Stuyvesant noted in 2012, “No matter how hard Marine Le Pen tries to reach out for Jewish approval, she is not going to get it and never will.” The FN has enjoyed no real increase in support from French Jews. Even setting aside the lack of electoral support, French Jews remain as committed as ever to depriving the party of any kind of platform in which to disseminate its ideas, even post-purge. In March 2011 Le Pen wrote in Le Point that “the Holocaust” was the ‘summum of human barbarism.” This was an obvious, and possibly calculated, departure from her father’s oft-repeated description of Jewish casualties during World War Two as “a detail of the war.” The French Jewish radio station, Radio J, soon scheduled air time for her, claiming she would be subject to a “no holds barred” interview. In the end, however, Le Pen wasn’t even granted the privilege of running a Jewish gauntlet. The Union of French Jewish Students demonstrated against the invitation, and Richard Prasquier, the head of the Council of Jewish Institutions of France, condemned it as “unacceptable.” The interview was cancelled, and this was followed by further action when the Jewish council played a leading role in preventing Le Pen from participating in a public debate at the University of Paris. Thus, French Jewry responded to Le Pen’s silencing of elements in her own party not by rewarding her with support, but by muzzling her even more. The French lessons have been lost on smaller right-wing populist parties in Britain, the Netherlands, Belgium and Scandinavia, where Jewish populations (and therefore votes) are so paltry that pandering to Jewish sensibilities and disavowing “anti-Semitism” can only be interpreted as pathetic attempts to embrace the philo-Semitic cultural zeitgeist. These right-wing populist parties are extremely keen to point out that increasing anti-Semitism is directly linked to expanding Muslim immigrant communities. To my knowledge, none of these parties have displayed the fortitude necessary to convey to the voting public that, like us, Muslims have legitimate grievances against Jews, but that our interests lie neither with Muslims nor Jews. Indeed, sizeable Muslim populations represent a clear and present sociological problem for the West. But none of these parties have acknowledged this and stated that Islamic terror will cease to be a problem in the West if we repatriate these populations and cease to identify ourselves with Zionist goals. None have pointed out that Islam’s threat to the Western way of life is given its only real potency by immigration and growing internal constituencies with alien interests. None have had the courage to state that Israel could be consumed by the Islamic Middle East with little or no lasting impact on the West. None have been truthful enough to make it clear that the fate of the West is not linked to the fate of Israel other than when Israel directly manipulates the politics of the West for its own benefit. None have pointed out that the State of Israel is even younger than the Korean American Football Association, and that the territory of Palestine had been relatively peaceful for centuries prior to the Jewish invasion and ethnic-cleansing of the area. Instead these parties have bought into the idea that we must choose a side in this “war with Islam,” and side with the other part of the “Judeo-Christian” alliance. The alliance, of course, is an extremely uneven one, consisting largely of the West pouring endless money, arms and resources into the coffers of Jewry. As part of the bargain, our reward seems to consist mainly of witnessing tear-jerking homecomings of our troops in flag-draped caskets. Despite the banality of pro-”Izruhl” logic, ostensibly right-wing groups and populist politicians have been competing with each other to win Jewish affirmation. 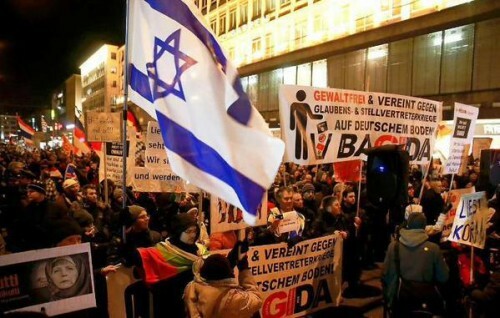 PEGIDA’s demonstrations, like those of the EDL, are littered with Israeli flags and proclamations of loyalty to the interests of the Jewish state. I’ll honestly state that I feel ill-equipped to declare PEGIDA controlled opposition, because at the time of this writing I lack a sufficient amount of relevant facts to make a careful judgment. However, I do interpret PEGIDA’s pro-Jewish posturing as, at the very least, a clumsy attempt to navigate the boundaries of German political correctness. By muting any critique of Jews, PEGIDA has managed to form a coalition of race realists, anti-immigration activists, concerned “middle of the road” citizens, and even leftists who fear that the liberties they associate with liberal democracy are under threat from radical Islam. But simply forming such coalitions cannot be an end in itself. What can the coalition accomplish, and what are its prospects beyond protesting the specific issue of Islamic encroachment in Europe? Has the exclusion of the wider racial-historical context, and the focus on a single issue, helped slow immigration? Has it helped bring about cultural change? Does it do anything other than reinforce the presence of the pro-Israel position on the Right? Can this rag-tag coalition achieve anything while lacking serious internal ideological consensus? Perish the thought that anyone could be deeply critical of Israel! This is Cuck-Populism. It is populism that strains to qualify itself via philo-Semitism, and therefore via foreign interests. It has no place being even remotely linked to identitarianism, ethno-nationalism, or White advocacy. Within European nationalism, muting the discussion of Jewish influence and publicly condemning anti-Semitism hasn’t just been done under legal duress, in misguided attempts to gain bourgeois respectability, or as part of a simple-minded overture to the Jewish vote. Such moves have also been employed as a tactical consideration in attempts to win over coalition partners who otherwise might refrain from cooperation. In Austria, the center-right Austrian People’s Party (ÖVP) formed a coalition with the nationalistic, anti-immigration Freedom Party of Austria (FPÖ) between 2000 and 2005 in order to form a government. Although beating the ÖVP in the 2000 elections, the FPÖ distanced itself from “anti-Semitism” and made a number of Le Pen-like ideological and staffing concessions in order to make itself a more “palatable” coalition partner. The results were uniformly negative. Firstly, the Austrian government was subjected to several months of unprecedented EU sanctions against a member state simply for the ideological past of the FPÖ. The other fourteen member states suspended bi-lateral political co-operation, maintaining only “technical” diplomatic relations pending the removal of the FPÖ from the government coalition. Israel and the United States recalled their ambassadors from Vienna. Far worse, however, was the impact that sitting in government had on the tamed FPÖ. The party made numerous concessions to mainstream conservatism, taking on the appearance of being part of the establishment and rapidly losing its edgy status as a protest party in the process. And despite muting discussion of Jewish influence, the FPÖ continued to come under sustained Jewish assault. The World Jewish Congress waged ceaseless public relations warfare on the FPÖ for its “anti-Semitism and racism,” and party leader Jörg Haider was sued by Ariel Muzicant, the head of Vienna’s Jewish community, for the “anti-Semitic” crime of pointing out the irony of the oft-perspiring Hebrew sharing his first name with a brand of laundry detergent. The cumulative impact of these developments translated into a fairly rapid electoral decline. A final explanation for the taboo hanging over the Jewish Question in modern right-wing discourse deserves some reflection. The Jewish narrative of World War II is successfully entrenched in White minds, where it is germinated from the earliest age possible. The hallowed “lessons” to be derived from the “Holocaust,” in effect the blueprint for the destruction of homogenous White society, make any dissent from the Leftist norm tantamount to the severest form of social delinquency. Invoking any criticism or theory that is antithetical to Jewish interests will inevitably carry even the faintest echo of the Horst Wessel Lied, at least for the time being. This is unavoidable, and in today’s engineered social climate, likely to put one beyond the pale or, in some countries, even behind bars. This is the case despite the soundness of your mind, the pureness of your morals, or the dignity of your character. Additionally, regardless of the extent of our race realism, our opposition to immigration, and our dedication to the cause of White ethno-nationalism, many of us have internalized the impact of the Jewish narrative of World War II on some level — whether its material content, or its lasting educational, societal, or legal legacy. White Nationalists need to deal with the problem of the Holocaust. I have argued that the root of the problem is our people’s willingness to accept unearned guilt and punish ourselves for it. The problem, in short, is psychological and moral, not historical. Thus Holocaust revisionism is not the answer. It is not necessary for White Nationalism. At best, it can supplement an essentially moral argument for White Nationalism. At worst, it distracts us from dealing with the deeper roots of Jewish power and White weakness. Thus, ultimately, we are not so much saving our people as becoming a new people. Hence “our form of humanity” consists specifically of Whites who have, through a Nietzschean revolution in values, overcome Jewish power and White weakness at their roots, thus becoming Whites who, once again, have a future. This certainly reads well, but I’m not entirely convinced that the need to either “deal with” or “confront” the Jewish narrative of World War II will even be a permanent fixture among the difficulties facing White advocates of coming generations. With the rapidly dwindling number of “Holocaust survivors” telling lampshade tales to High School students around the country, Jewish leaders, academics and political figures are increasingly forced to confront the impending “historicization” of National Socialist Germany and the wartime atrocities it is alleged to have committed. This is essentially the inevitable process whereby events in living memory eventually pass into a more neutral and purely historical interpretation, devoid of emotional power. In their hubris, Jews, like King Canute, have attempted to hold back the tide. Indeed, they have been fighting this development since the 1980s, when Jewish historian Saul Friedländer responded to the German scholar Martin Broszat’s call for the historicization of National Socialist Germany by attempting to draw an esoteric aura around the entire subject. According to Friedländer’s Nazi Germany and the Jews, written primarily as a response to Broszat, Germany under Hitler represented “the negation of all life,” and the period 1933–1945 was unlike any other in history. Other historians whose works assisted the historicization of that era, such as Ernst Nolte and Andreas Hillgruber, were simply denounced as “Nazi apologists.” Nolte’s crime was to engage in the otherwise encouraged historiographical methods of comparison and contextualization, specifically his argument that the German mass execution of Jewish partisans was a quite obvious response to Soviet Gulags and terror. Jews continue their attempt to hold back historical inevitability, but all the money in Jewry won’t stop the world turning, or time progressing. Eventually, not soon but eventually, the name of Hitler will resonate no more deeply with our youth than does the name of Napoleon or Genghis Khan. Jews have always appealed to putative past persecution in attempts to obtain immunity from criticism in the present. In Germany they bewailed their treatment at the hands of the Tsar. In Holland they pointed to the expulsion from Spain. In Restoration England they grumbled about the thirteenth-century Edict of Expulsion under Edward I.
Jews may cling to the “uniqueness” of the “Holocaust,” but we must not fall into the same way of thinking. Jews live in an eternal present when it comes to their perception and historical memory of persecution. To them, the imagined massacres of the Crusades may as well have occurred yesterday. We, for our part, would err greatly to think that we face any different a task than those who came before us, and who raised the Jewish Question regardless. Like every atrocity propaganda ploy, it cannot resist eventual historicization. With each passing day, the “cloud” that World War II places over us dissipates a little more. In this respect at least, the future looks brighter for us, and not for them. Of course, we ourselves are not blessed with time. In perhaps fifty years, if current demographic trends in our lands are not challenged and reversed, the challenges facing White ethno-nationalists will be perhaps insurmountable. To my mind, this urgency makes the need for directness all the more acute. This directness requires the abandonment of the taboo on the Jewish Question. Where legal restrictions are in place, every effort must be made to devise sophisticated discourses that circumvent and subvert the central aims of anti-White legislation. The truth must get out in any form possible. If existing laws prevent clumsy, overly abusive, or volatile speech, we must see the positive in that. Such circumstances will simply force the production of more refined, careful, and precise indictments of the pernicious influences destroying our people. If this material, more palatable perhaps, induces the support of some of the bourgeois “respectable” types then that is an added bonus. All those who claim to support the right of European peoples to exist and exert sovereignty over their borders and territories must abandon outright any support, feigned or otherwise, for the outlaw State of Israel and its supporters in the Jewish Diaspora. There can be no room for Israeli flags at the demonstrations of true ethno-nationalists. The presence of such paraphernalia at our rallies dilutes our message, links us to elites that do not serve us or our people, and provides support to a nation that will simply never reciprocate. We oppose all non-White immigration, not just Muslim immigration. Our opposition to the mass movement of foreign peoples into our lands is racially-based. It is not cultural and it is not religious. We cannot be ashamed to see the world in real terms: a world composed of races and ethnicities, each with interests that will conflict and collide as one of life’s inevitabilities. We embrace the reality of this struggle. We refuse to be reduced to a footnote in the DNA of a mongrelized future mankind. All efforts by the Right to pander to the Jewish vote should be ridiculed from within and objected to in the harshest terms. These efforts are inherently amateurish and betray a wilful ignorance of the interaction between Jews and the West. Such efforts are an embarrassment to the cause of our people. Our concern is not protecting Jews from Muslim immigrants. Our concern is with protecting our own people from harmful minorities who are seeking to satisfy their own interests while our own people are led to believe they don’t have any interests of their own. We must not ever be diverted from this task. Like the presence of Israeli flags at our rallies, speeches urging the protection of Jews from invading tribes should be ridiculed from within and objected to in the harshest terms. The political leaders of our movement should be preoccupied with the well-being of only one people — their own. If parties allied to our cause are successful in getting into coalition government, they should not dilute their message or pander to the banality of political compromise. This tactic will fail to give these parties the anticipated “breathing space” in which to grow. The entire system will be brought to bear on them, as occurred in Austria, regardless of any concessions they may offer to the beast. Austrian support for the FPÖ actually increased because of this pressure, but the fatal error came when the FPÖ attempted to “normalize” its politics. It was not the attack of the system that lowered the FPÖ vote — it was the perception that the FPÖ had in fact become a part of the system. When such breakthroughs come in the future, compromise should be refused. The identity and position of the party must be rigid and clear. In short, and to conclude, we need a few more people like David Duke, or indeed the editor of this site, who simply refuse to follow the taboo over Jewish influence. Our case has never been better documented. Our position is morally upright. Our people need our honesty and our knowledge. So break the taboo today. Raise the subject with a relative, a friend, or a colleague. Start the discussion. Who knows where it might lead.